There’s a stubbornness to Gaffigan’s choice to puncture the tension surrounding Jeannie’s condition that invites disappointment. After all, stand-up is a uniquely revelatory art, with the ups, downs, and—in Gaffigan’s case—yawning abyss of life nakedly transformed in front of strangers. Some mine that personal tragedy and pain, and come up with exquisite gems. Patton Oswalt did it last year, and Hannah Gadsby, in Nanette, recently emerged with something so radioactively brilliant as to throw her very vocation into question. But Gaffigan’s choice to stick to his signature comic pathway has its own integrity, too. Fear and pain nibble around the edges of Gaffigan’s usual comestible comedy. Bringing his bearlike hunger to the typically uninspired cafeteria of the facility where his wife is undergoing brain surgery, he muses, “How about selling an MRI machine and getting a pasta station.” But he also responds to the audience’s applause at the news of Jeannie’s relative good news by admitting, “I didn’t remove it—I was in the other room soiling myself.” Another setup about his fear over being left alone with his motherless children ends with Gaffigan slapping out the punchline, “Those five kids are gonna be put up for adoption.” It’s a slapstick diversion from the genuine fear that saw the comic taking his kids with him to touring gigs as far away as China in the wake of Jeannie’s operation. 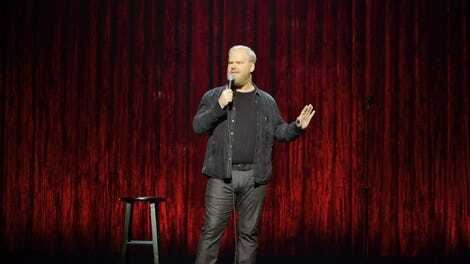 In the second half of the show, Gaffigan takes us on a tour, too. He recounts his travels to lands where his ever-present self-effacement renders inert his parochial jabs at Japanese toilets, British manners, and incomprehensible Scandinavian athletic enthusiasms. Sure, a Brit’s omission of the “the” before “hospital” might make them sound like “a polite caveman,” but boorish Americans like Gaffigan flock to the M&M store in Piccadilly Circus, so call it even. That equanimity is part of what makes Gaffigan so reliably pleasing—if not precisely predictable. 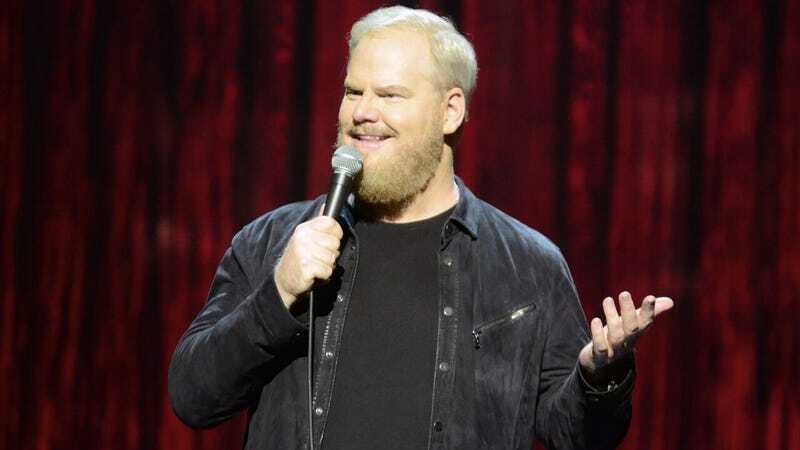 His comedy—look for jokes about his colonoscopy, uncomfortable massages, and being the Pope’s opener in Philadelphia—is personal only insofar as it is formed around Gaffigan’s deliberately inoffensive outline as he rumbles through a life where he’s grumblingly content to be his own punchline. But steadfast progress through the unthinkable carries its own comic power. A running bit all through Gaffigan’s career has been the disapproving interruptions from an imagined, sententious observer, warning, as here, that Gaffigan shouldn’t joke about his new beard indicating a recent allegiance to Al-Qaeda. The joke is always that there is more going on in Gaffigan’s head than his “clean comic” image admits. (Something his late, thoughtful sitcom made hilariously clear.) Throughout Noble Ape, the idea that there are some things you just don’t joke about gets punctured as much by Gaffigan’s stylistic resolve. In an interview after Jeannie’s diagnosis, the comic talked through his decision to keep making jokes. Noble Ape shows how Gaffigan’s onstage persona can weather all storms and come out still getting the same laughs.